It’s one of the New East’s most photographed sites — but what secrets does it hold? The “Buzludzha Monument,” as it would become known, served the combined functions of a memorial, a museum and a ceremonial venue. It remembered the site where, 90 years earlier, Dimitar Blagoev and his followers had met in secret to found the Bulgarian Social Democratic Party (a forerunner to the Bulgarian Communist Party); where bands of Bulgarian patriots, generations apart, had battled first against Ottoman and then Nazi occupation. In the Party’s historiography, this location held almost sacred significance. During the opening weekend people queued up for hours in the hot sun, and doctors waited on stand-by to treat visitors for sunstroke. 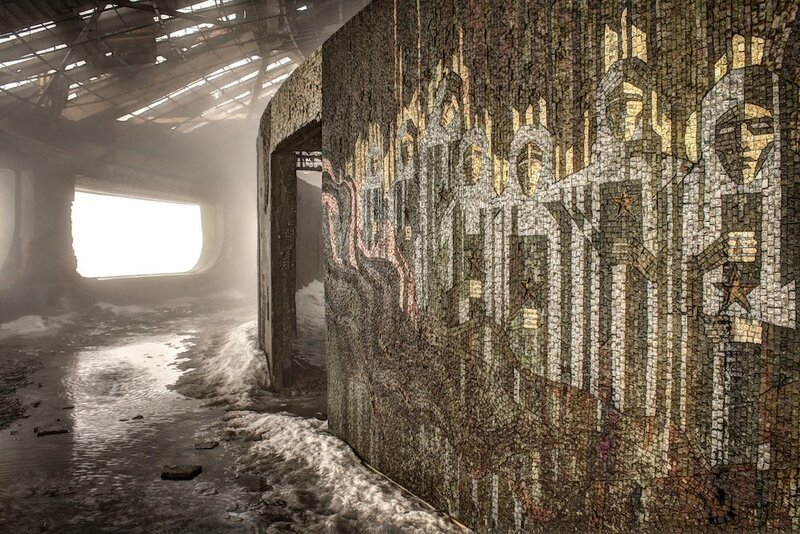 According to Party records, some three million pilgrims would pass through these doors while Buzludzha remained in use — as many as 500 per hour on national holidays. 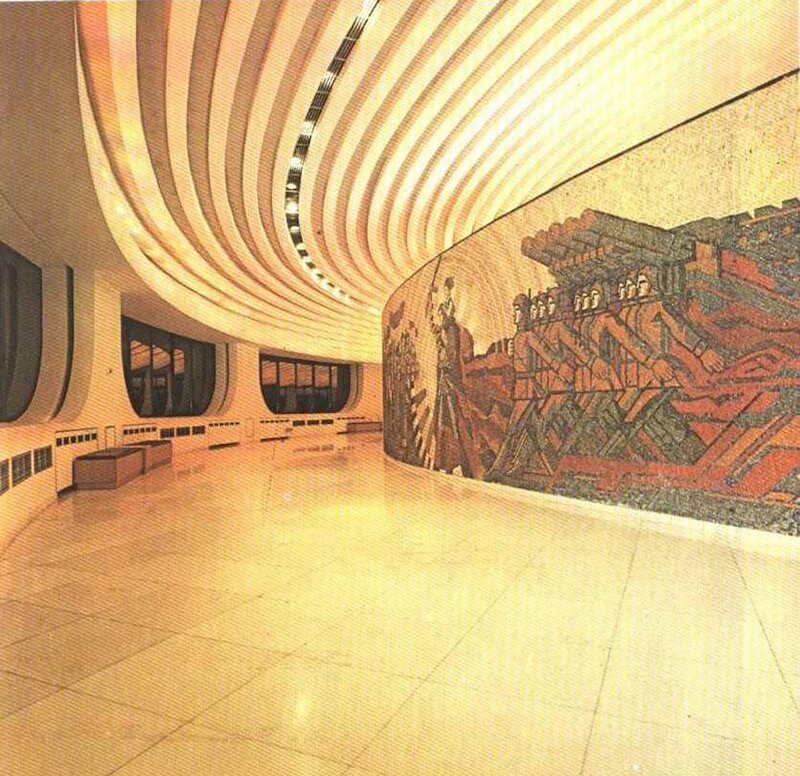 It had been the express design of architect Georgi Stoilov that this be a “Monument of the People.” Rather than being built using taxes collected by the state, the cost of the monument (14 million Bulgarian levs: upwards of $34 million by today’s value) was funded instead through voluntary donations and the sale of commemorative postage stamps. Of the 6,000 people who worked on the monument over the course of the seven-year construction project, many were volunteers. Buzludzha would certainly be remembered, though not for the reasons the Party might have hoped. The monument was closed following the political changes in 1989, and sometime during the late 1990s its guards were dismissed, leaving the site vulnerable to looters and vandals. When the ceiling came down, wind and snow would accelerate the decay. 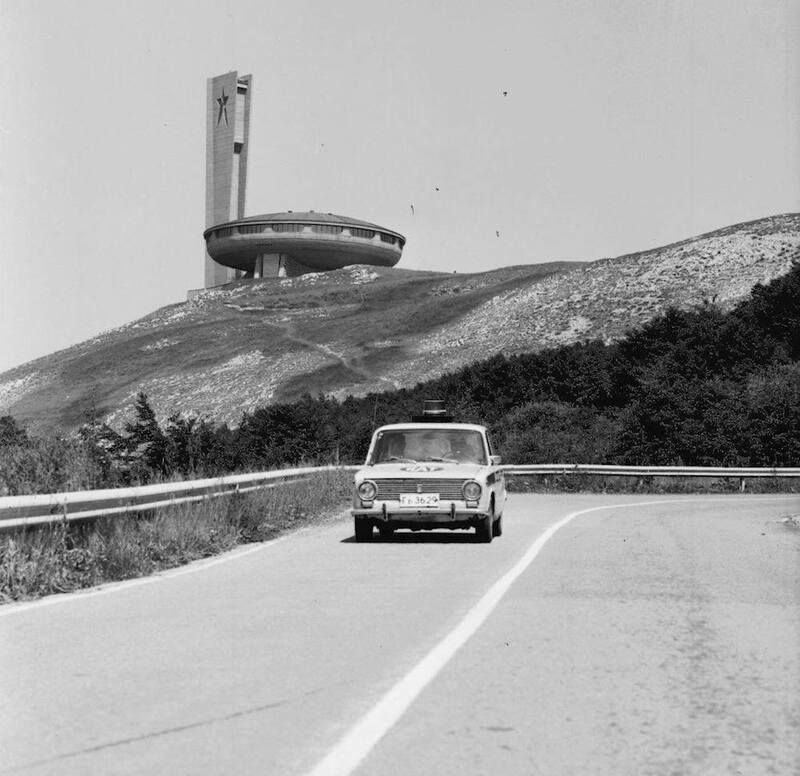 Whether appearing on the cover of books such as Rebecca Litchfield’s Soviet Ghosts, or illustrating CNN stories about “Bulgaria’s Communist UFO,” images of Buzludzha have become prime examples of what Owen Hatherley calls “concrete clickbait.” In these exoticising Western narratives, the words “UFO” and “Soviet” assume almost interchangeable functions as expressions of Otherness. 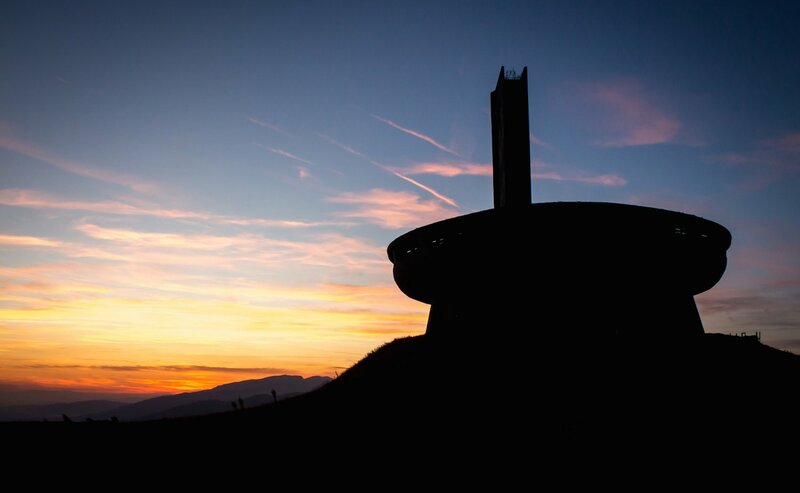 However, to de-sensationalise the monument entirely — to reduce Buzludzha to a product of history and politics — would be equally problematic, because this monument was always intended to be sensational. “This intergalactic saucer echoed popular themes of the era,” Georgi Stoilov explains, sitting on a couch in his Sofia office. 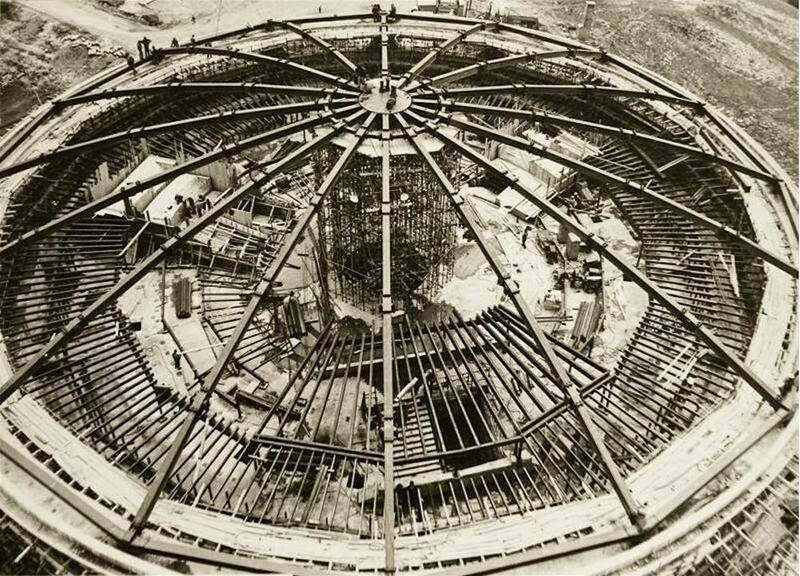 Buzludzha’s architect, a former mayor of Sofia and current president of the International Academy of Architecture, had been at the forefront of a new era in Bulgarian architecture. 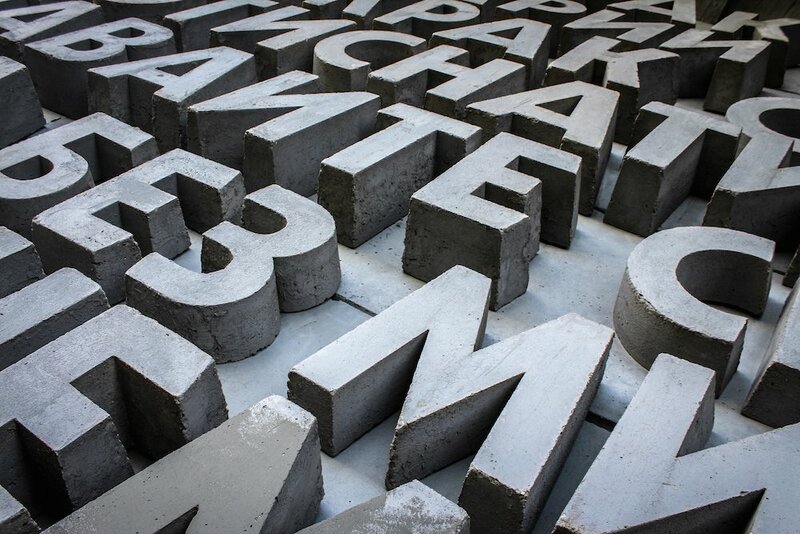 Following Khrushchev’s 1956 denouncement of Stalin, a wave of de-Stalinisation swept across the USSR and its allied nations — affecting everything from government policies to public art and architecture. No longer bound to the prescriptive Socialist Classical style, architects in these states started looking further afield for their inspiration. 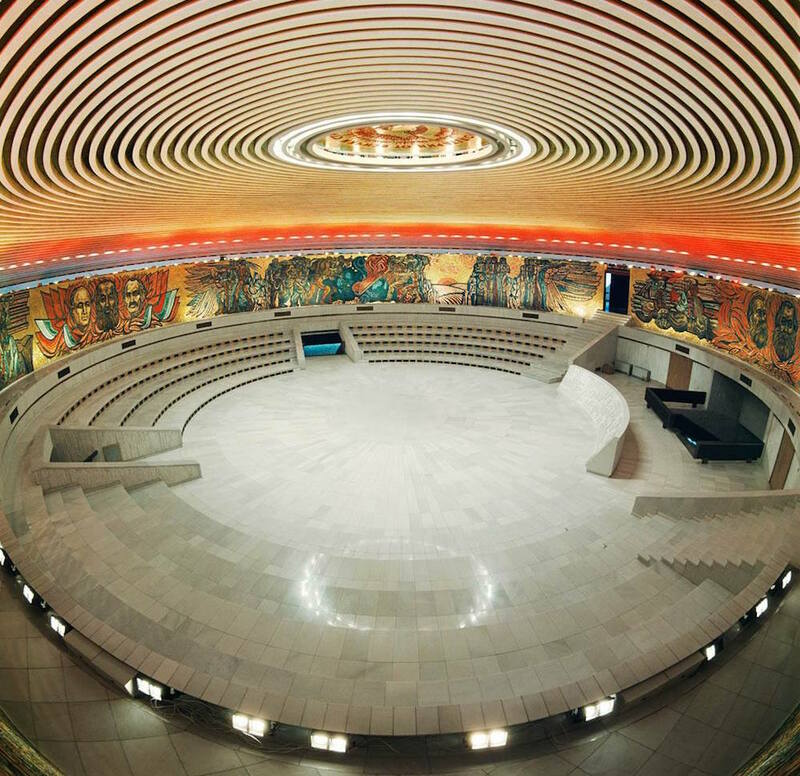 Buzludzha then, was the symbolic ritual hall of a timeless society: an intergalactic pantheon with its roots in antiquity and its future reaching onwards to the stars; and it is resoundingly Bulgarian. 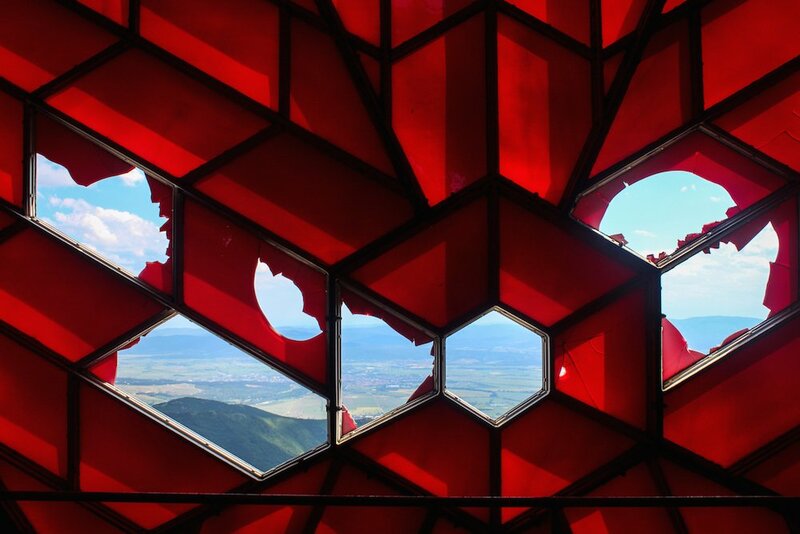 For all Buzludzha’s aspirations of timelessness, however, its symbolic language of hammers, sickles and stars has served to anchor it to a past that is fast receding. In November 2016, the monument became more problematic still, when Bulgaria passed a new law on decommunisation, effectively outlawing the public display of communist symbols. 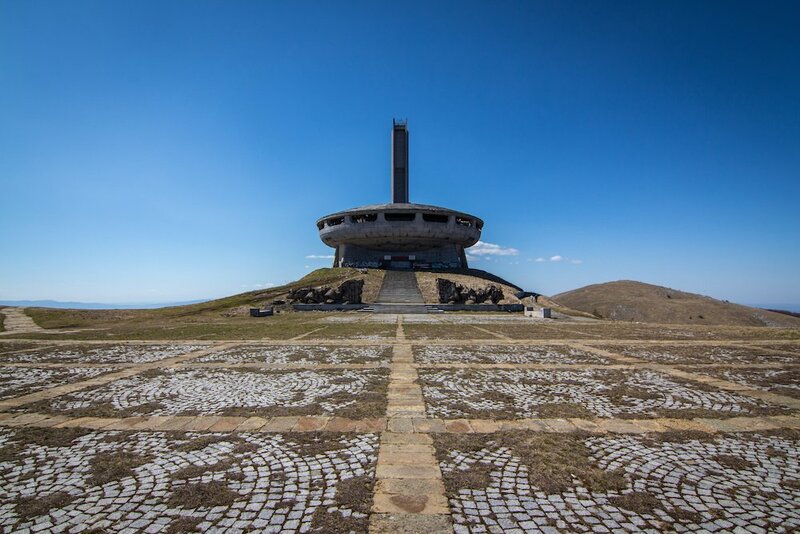 Nevertheless, some Bulgarians are keen to reinforce Buzludzha’s political associations. After their 45-year single-party regime came to an end in 1989, the Bulgarian Communist Party rebranded themselves the Bulgarian Socialist Party. They still command a sizeable share of votes today, and have served in several coalition governments under the new democratic system. 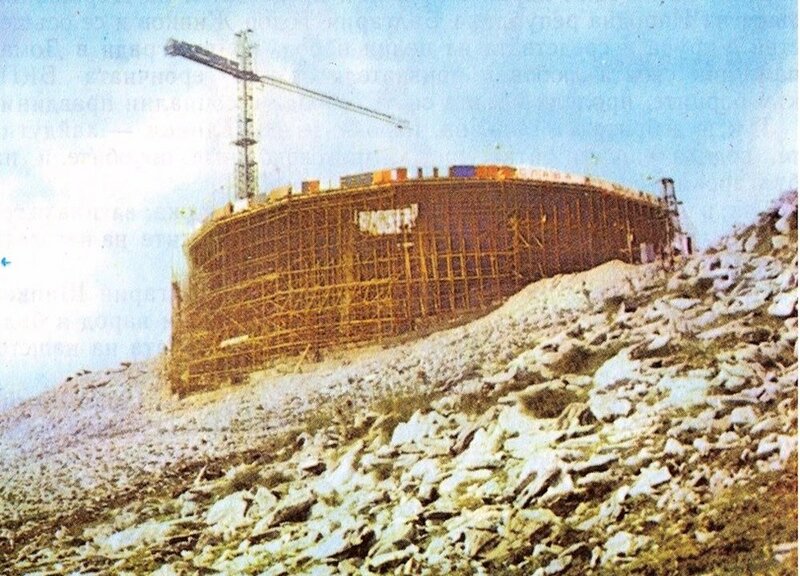 Every August the BSP holds an annual gathering on Buzludzha Peak; and ever since the monument was nationalised in 1992, the Socialists have been eager to regain ownership. Most recently, the BSP submitted a formal claim in June 2017. The application was rejected however, when a government committee voted 12-to-7 against the transfer of ownership, largely due to the lack of any actionable plan. Bulgarian Socialist MP Krum Zarkov expressed a desire to “stop the decay,” but details of cost analysis, funding methods, timeframe and intended future use were absent from the application. The socialists are not the only group with plans for the monument, though. 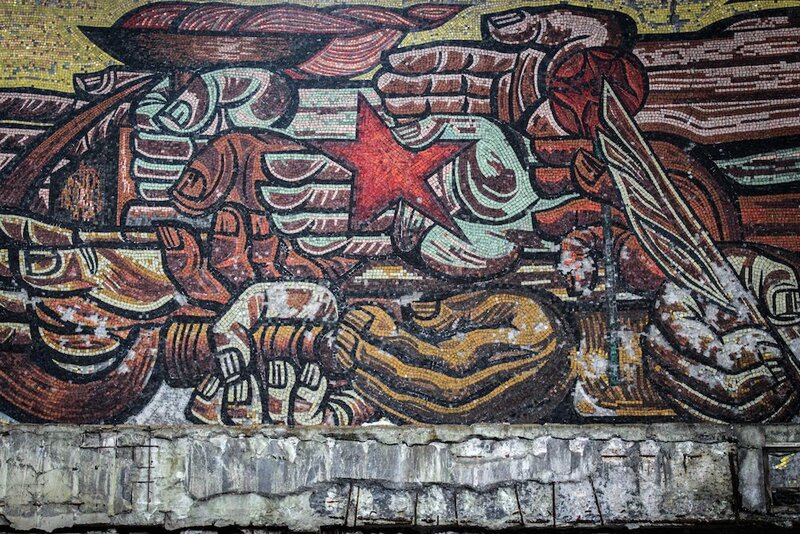 Dora Ivanova, a Bulgarian architect who leads a campaign for preservation, believes that Buzludzha will only survive if its political symbols are relegated to the history books, and if the monument is finally wrested from the hands of politicians altogether. 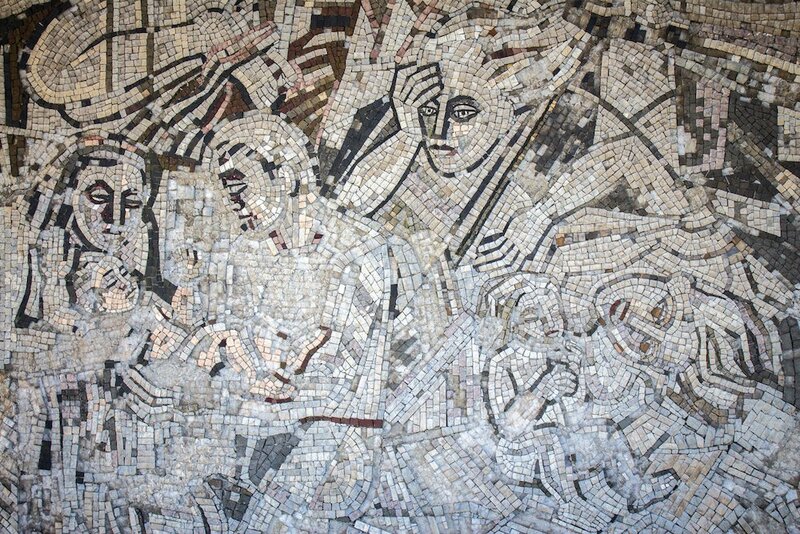 “Buzludzha needs to be preserved, before the mosaics are lost and the roof collapses — which could happen within a decade,” she warns. “But Buzludzha was and still is a political tool. In my opinion it can only be saved in the form of a de-politicised heritage site. 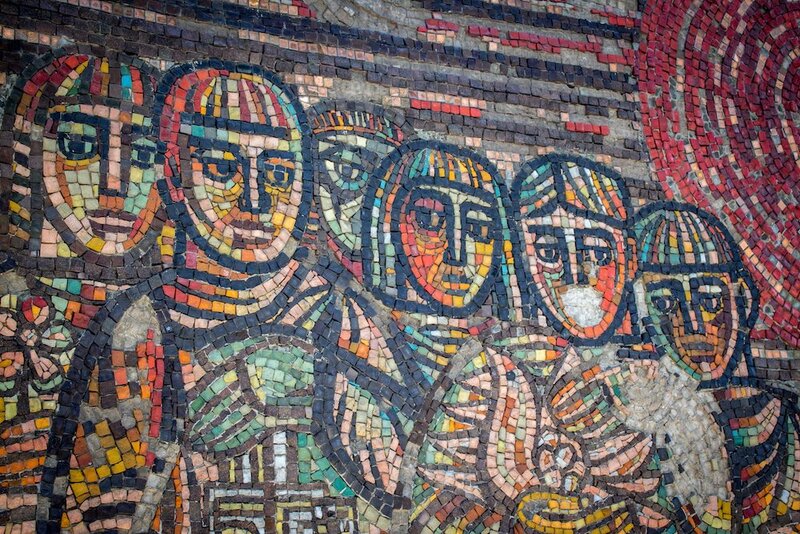 As a museum, Buzludzha could encourage productive discussions about our traumatic past — something which Bulgaria is still missing.” The mayor of nearby Kazanlak, Galina Stoyanova, shares the sentiment. 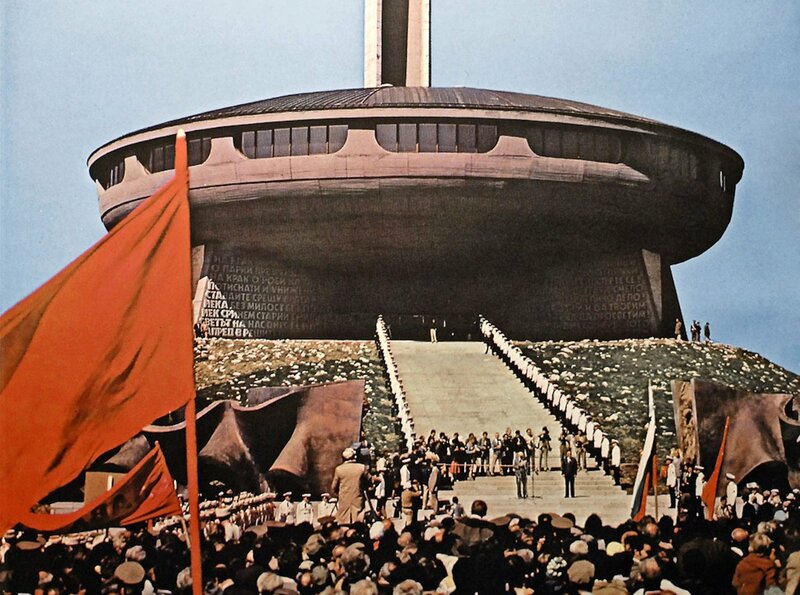 “Buzludzha is of value to us … and it is about time it became known as a unique architectural monument, not as a symbol of the ruin of an ideology. It is time to stop ideologising it,” she says. Restoring the monument to its original state is a prohibitively expensive option, while the painstaking repair of communist symbols would risk angering millions of anti-communist Bulgarians. Instead, Ivanova’s “Buzludzha Project” proposes a partial reconstruction that halts further damage while freezing the monument in its current, semi-decayed form. It is a diplomatic solution, and relatively affordable at a projected cost of between $1.2-2.3 million. 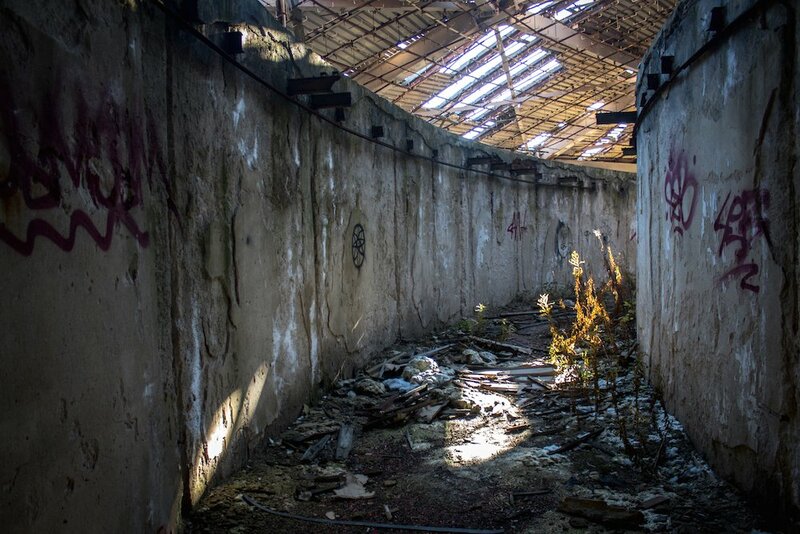 No restoration can begin, however, without the approval of the Bulgarian government; and to date, Buzludzha still hasn’t been granted official “monument” status. As it turns out, those exoticising stories in Western media might have proven beneficial. 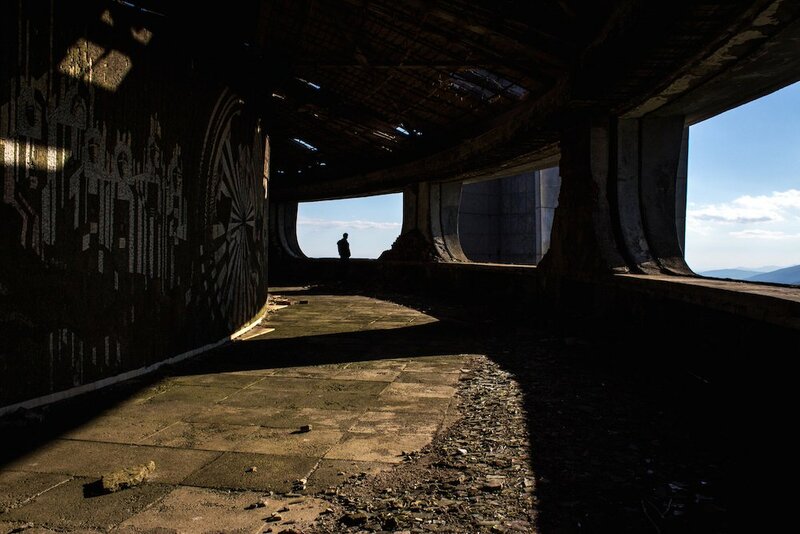 Buzludzha’s viral fame makes it increasingly difficult for local policy-makers to ignore, and each new feature in a list of “The 33 Most Beautiful Abandoned Places In The World” adds fuel to the argument for preservation. 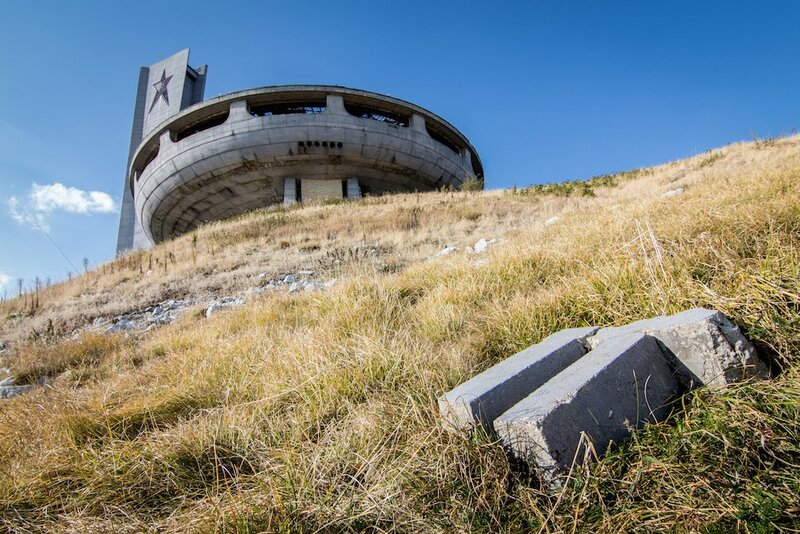 Buzludzha remains as politically controversial as ever — many Bulgarian politicians will avoid voicing support for fear of being branded “Communists” — but now at least, conversations about the monument’s future are beginning to be taken seriously. Only time will tell whether Buzludzha is still salvageable once that process of re-evaluation is complete.